Dear friends of the Truth. This is the position of our website. 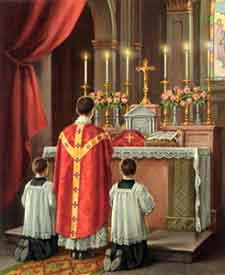 FIDELITY AMONG TRADITIONALISTS1. We are living in the Great Apostasy spoken of by St.Paul the Apostle. 2. The Vatican II Anti Christs have taken over the chair of St. Peter and will possess it until Christ returns. 3. There will never be another True Pope. 4. Christ will be back in the Generation of the Great Apostasy. Matt.24:34. 5. The general testimonial & judgment day starts on Pentecost Sunday and ends on the eve of Trinity Sunday. After the Great Chastisement. 1. The Heresies stemming from the Vatican II Council. 2. Cultism, elevating private revelations and their messages above the Apostles and the Divine doctrinal teachings of the Church. 3. Lack of Biblical knowledge and study. This speeds up the AntiChrist one world inter-faith Gospel and helps hasten the Lord’s return. When it comes to remembering one’s faults and virtues, it’s the faults that seems to get the attention more so than the virtues. In the case of St.Peter’s three time denial of our Lord in the court yard of Caiphas. Despite Pope Francis’ decree to include women and people of other faiths in the ritual that comes ahead of Easter. Remember folks; AntiChrist Francis was in Panama a few months ago and please don’t tell me this migrant surge wasn’t sponsored by him. Panama is noted to be the money laundering nation in the world. It’s also now controlled by China. Speaker Pelosi is being used by AntiChrist Francis. Dear faithful:When Pope John XXIII called the Vatican II Council he stated in his opening address that he wanted to bring all the Christians together, open the windows and let in some fresh air. However what he meant was, he wanted to bring all Religions together. Question; how do you bring all Religions together with Jesus as God Man. Simple; you make Jesus just another prophet by printing new Bibles and changing those prophecies that make him the Messiah. Palm Sunday is the first day of the Creation and here you have the people of Jerusalem hailing our King. Little did they realize they were saluting the God-Man Who created them and started the creation on that very day. Then they run away when he’s arrested not realizing that they’re now sharing in Adam and Eve’s sin of betrayal. So, now the Lord goes to atone for their sins and for making the imperfect God in Adam by dying on the same DAY that he created him. Good Friday. The Passover spring full moon is God’s witness in the sky. Psalm 88:38. Happy Birthday World. It’s so simple and obvious that it’s pathetic, just as the same reasoning of His return on the Birthday of the new life of Man, Pentecost Sunday. Edwin Henry Pudwill, loving Husband, Grandfather and Great-grandfather has left us to be with the Lord on March 27, 2019, at the age of 96. These time tested vaccines should be accepted, these new one’s I would question.